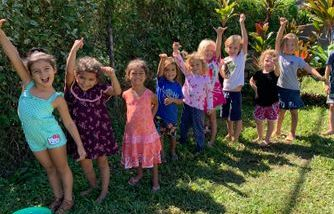 Aloha School Early Learning Center is the only Non-Profit Preschool on the entire North Shore of Kauai that is Nationally Accredited by the National Association for the Education of Young Children (NAEYC). We are honored to have earned such a high accolade and recognition of our Staffs hard work and effort to service our community to the best of our abilities, while maintaining a National Standard. In fact, we earned a 99.2% on our most recent Re-Accreditation Process. We also earned 10 out of 10 commendations from the NAEYC. Aloha School has been serving the North Shore Kauai Community since 1978. 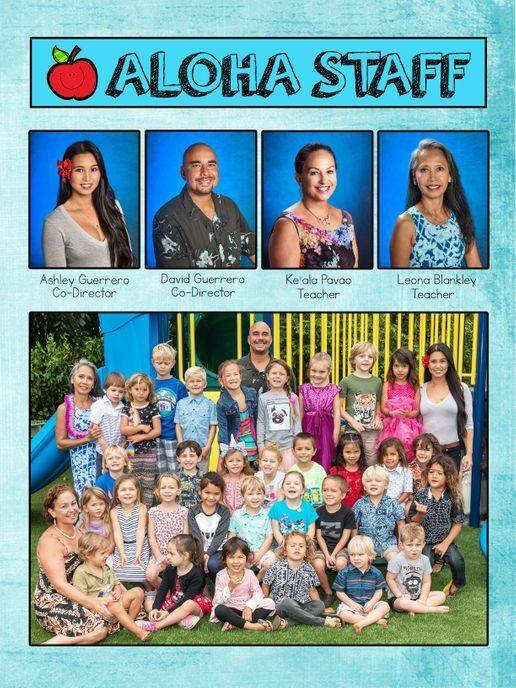 Two of our current five Teachers have been Teaching here at Aloha School for over 25 years each. The other three Teachers have all taught in Special Education for the Department of Education here on Kauai and in other preschools state wide. All three are Certified Para-Professionals in the State of Hawaii. All of our staff have Early Childhood Education Backgrounds & degrees. We strive to give our keiki and their 'ohana the best early learning experiences in a safe & fun environment while instilling love, culture & Hawaiian values. Aloha School believes in spending quality time with our keiki and understand that having good teacher to student ratio is important to help the children thrive to their fullest potential. Full enrollment for our school is 36 students, ages 2.8 through 5 years old. All of our teachers and staff are certified under People Attentive to Children (PATCH), Career Access and Navigation of Early Childhood Systems (CANOES), are CPR and first aid certified and have Early Childhood Education backgrounds. Two of our teachers have been teaching at Aloha School for over 20 years, three of our teachers are certified Paraprofessionals for the State of Hawaii and all three have experience working in special education settings in Hawaii Department of Education schools. All of our teachers provide exceptional qualities, cultural knowledge and share an amazing passion for teaching. Aloha School Early Learning center is located in beautiful Hanalei, Hawaii. We are a non-profit 501©(3) organization designed to instill cultural morals, values and aloha within our keiki, while focusing on early childhood education. Aloha School has been operating since 1978, is licensed by the state of Hawaii and is currently the only non-profit Nationally Accredited Preschool on the north shore of Kauai through the National Association for the Education of Young Children (NAEYC). The preschool is arranged to promote growth in all areas of learning including language, creative arts, large and fine motor skills, pretend play, mathematics, science, music and dance, sensory, writing skills, reading, problem solving and social interaction. We provide unique culture opportunities and experiences and developmentally appropriate education enhanced by our Hawaiian Curriculum "Lei Aku, Lei Mai". Our staff consistently communicates with Hanalei Elementary School to ensure that we are preparing our graduating students with the knowledge and skills that are needed and expected upon entering kindergarten. The Aloha School is dedicated to provide a vital educational environment for young children; one which provides quality learning experiences in all areas of development, helping children and families to achieve their fullest potential. -Each child is unique with an individual pattern of growth, personality, learning style, and family background. and physical growth to prepare for further learning skills. -Children are motivated by their own desire and sense of wonder of the world. -To provide an environment that is safe, loving, and nurturing. -To promote the optimum physical, social, emotional, and intellectual growth of each child. -To develop in each child, a feeling of confidence, and self esteem and to promote initiative and independence. -To help children to understand their world, by exposing them to a variety of experiences and materials, and by giving them many opportunities for imaginative play and creative activities, in art, music, and movement. -To help children learn respect for themselves, others, and their environment and to help them develop a sense of responsibility for their own actions and for the well being of others. -To assist children in developing problem solving abilities. -To expose children to a diverse and wide variety of children’s literature by reading aloud, felt stories, puppet plays and to develop an ongoing interest in books and reading. -To create a partnership between home and school, based on mutual respect and close communication. WE ARE CURRENTLY THE ONLY NATIONALLY ACCREDITATED PUBLIC PRESCHOOL ON THE NORTH SHORE OF KAUAI!!! -Promote positive relationships for all children and adults to encourage each child's sense of individual worth. -Implement a curriculum that fosters all areas of child development: cognitive, emotional, language, physical and social. -Use developmentally, culturally, and linguistically appropriate and effective teaching approaches. -Provide ongoing assessments of a child's learning and development and communicate the child's progress to the family. -Promote the nutrition and health of children and protect children and staff from illness and injury. necessary to promote children's learning and development and to support families' diverse interests and needs. -Establish and maintain collaborative relationships with each child's family. -Establish relationships with and use the resources of the community to support achievement of program goals. -Provide a safe and healthy physical environment. families, and staff have high-quality experiences. reliable NAEYC program assessors to ensure that we continue to meet standards.